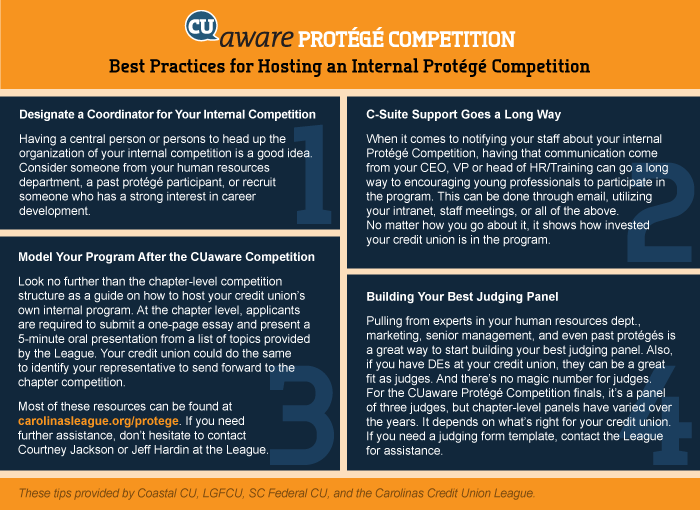 On December 6, 2018 at 6:00 pm the Piedmont Chapter will host the chapter-level CUaware Protégé Competition for eligible credit union professionals, ages 18-35. Each credit union is encouraged to select one candidate to represent them in the chapter-level competition. Judging will be based on a standard application essay and a five-minute oral presentation. Candidates will have a wide range of speech topic choices available. The deadline to submit your application and essay to the chapter is November 16, 2018. The winner and two runners-up at the finals in January will receive special benefits including scholarship opportunities at regionally recognized conferences and places on the CUaware Council.